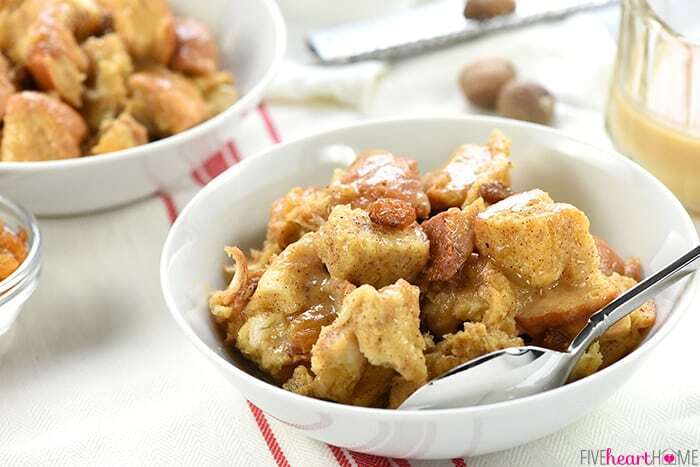 Slow Cooker Eggnog Bread Pudding effortlessly cooks up in the crock pot for a warm, delectable, holiday breakfast, brunch, or dessert! 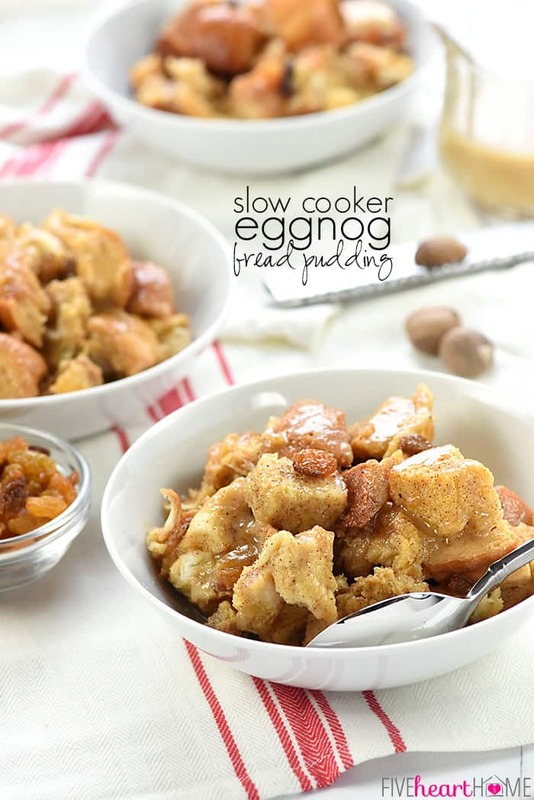 Today’s Slow Cooker Eggnog Bread Pudding is special for a couple of reasons. 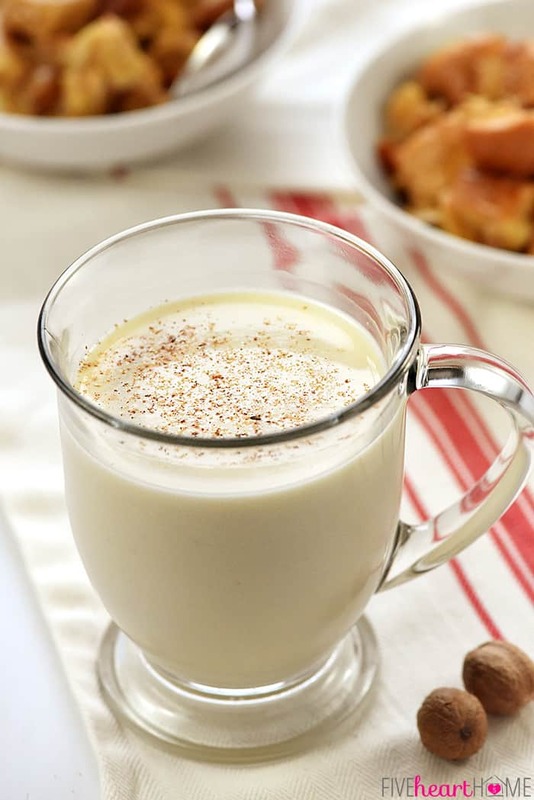 It’s my first eggnog recipe of the year…and if you’ve been hanging around Five Heart Home for awhile, you know how I like me a good eggnog recipe come December. 😉 But even more importantly, it’s totally versatile! 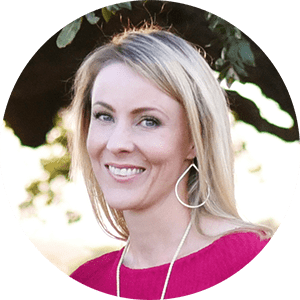 You can enjoy it as a special breakfast or brunch, since it’s akin to a baked French toast casserole. Or you can serve it as a warm, delectable dessert! Let’s explore both options, shall we? This recipe was actually inspired by my Overnight Eggnog French Toast Casserole from a few years back. Both recipes start with a loaf of cubed French bread that’s soaked in an eggnog custard and flavored with vanilla, cinnamon, and nutmeg. But while the original recipe hangs out in the fridge overnight to get baked off in the morning, this version gets transferred to the slow cooker as soon as the ingredients are combined, where it spends a couple of hours cooking into soft, gooey perfection. 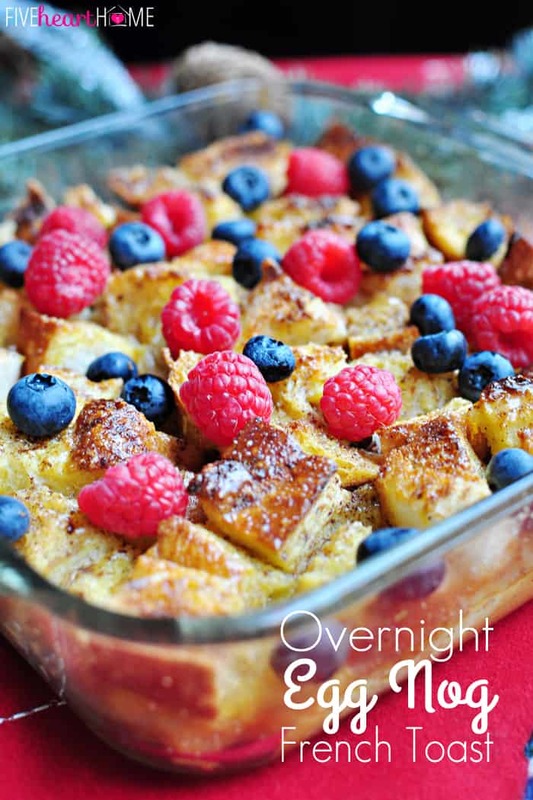 So call it baked French toast casserole if you like and pop it in the slow cooker first thing in the morning for an ah-mazing breakfast. Alternatively, start it a bit later and serve it for brunch. 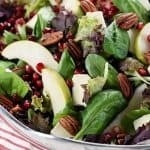 Either way, this recipe won’t be tying up your oven or your stovetop, which is a pretty invaluable quality during the holidays when oven real estate is at its prime. 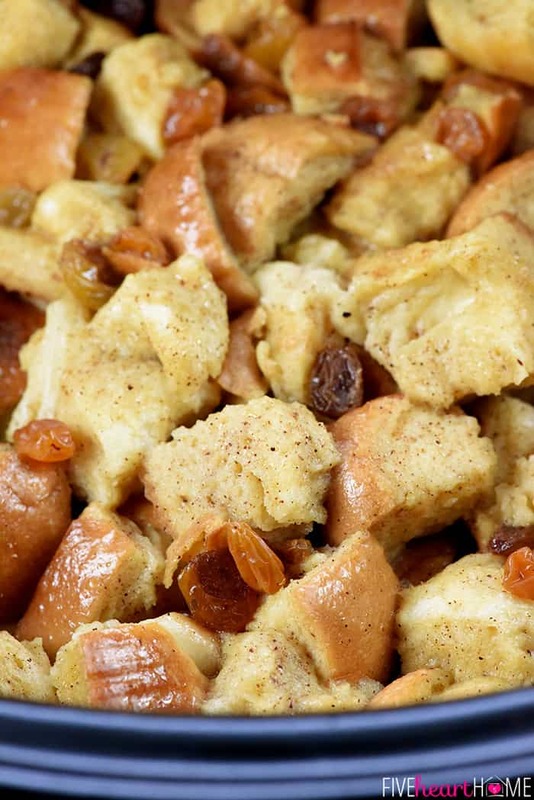 However, if you’d like to highlight the bread pudding angle of this bread pudding, make it for dessert! Bread pudding can often be found on the dessert menu at fancy restaurants, making it feel like an extra-special treat. 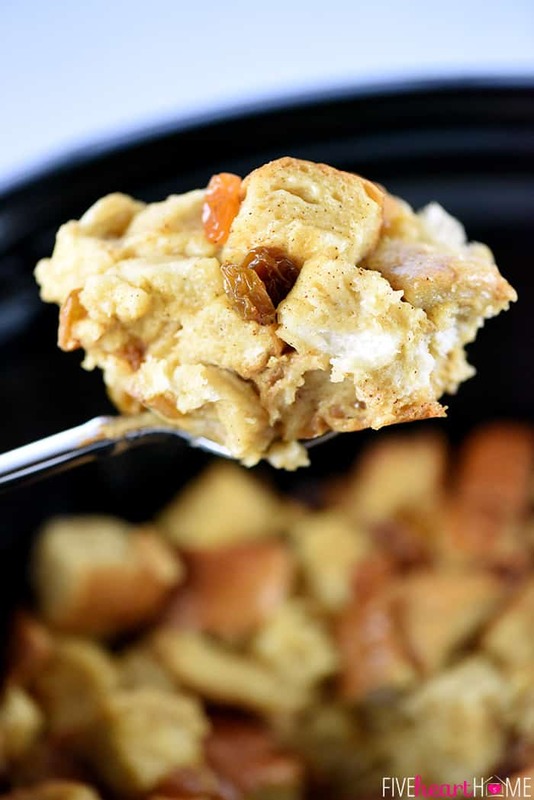 That being said, nobody has to know that this Slow Cooker Eggnog Bread Pudding is extremely quick and easy to prepare. 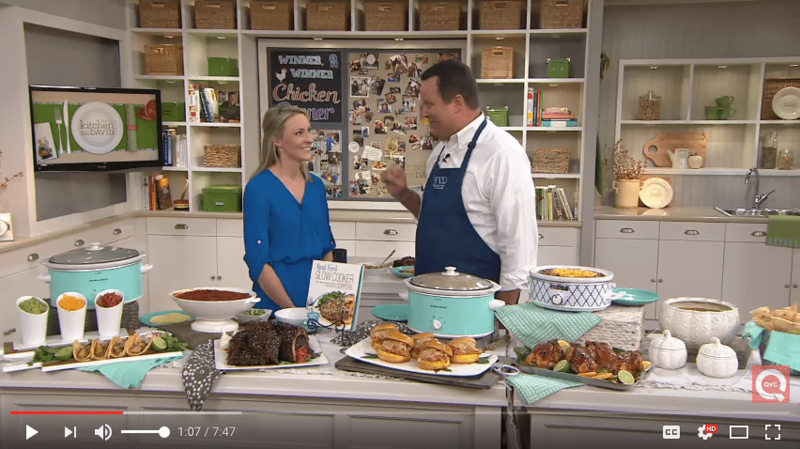 It’s great for gatherings because it can be served warm straight from the crock pot. 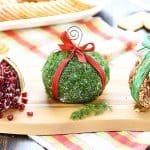 And the addition of eggnog gives it a festive holiday twist! This bread pudding is actually not overly sweet as-is. It has an undertone of eggnog that’s pleasant without being overpowering. It’s flecked with juicy golden raisins that add little bursts of fruit. And it’s drizzled with the most luscious eggnog syrup to take it from that’s-pretty-yummy to oh-my-gosh-over-the-top! Seriously, don’t skip the eggnog syrup. It takes about 5 minutes to whip up and it adds extra moisture and yet another layer of eggnog flavor to this dish. 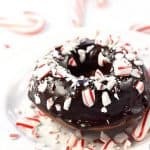 It also allows everyone to adjust the sweetness of their breakfast/brunch/dessert to their liking. 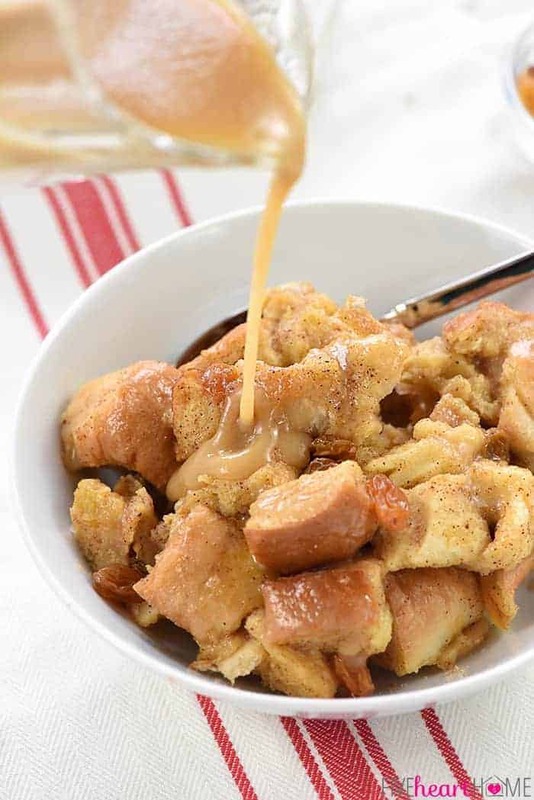 Just like adding your preferred amount of maple syrup to a pile of pancakes, you can drizzle your bowl o’ bread pudding with as little or as much eggnog syrup as you desire. My primary tip for this recipe is not to overcook it, which can result in dry bread pudding that sticks and darkens around the edges. 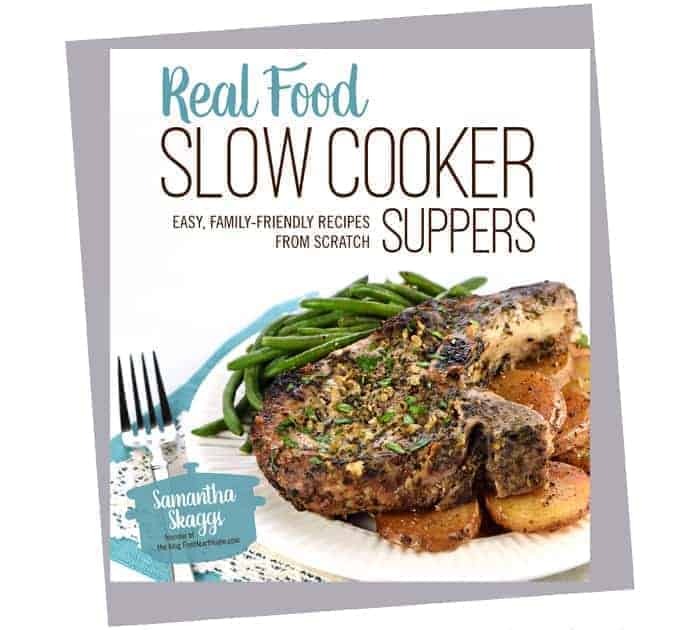 Through extensive trial and error while writing a certain slow cooker cookbook (ahem), I’ve learned that slow cookers can vastly vary in how hot they run and how quick they cook. 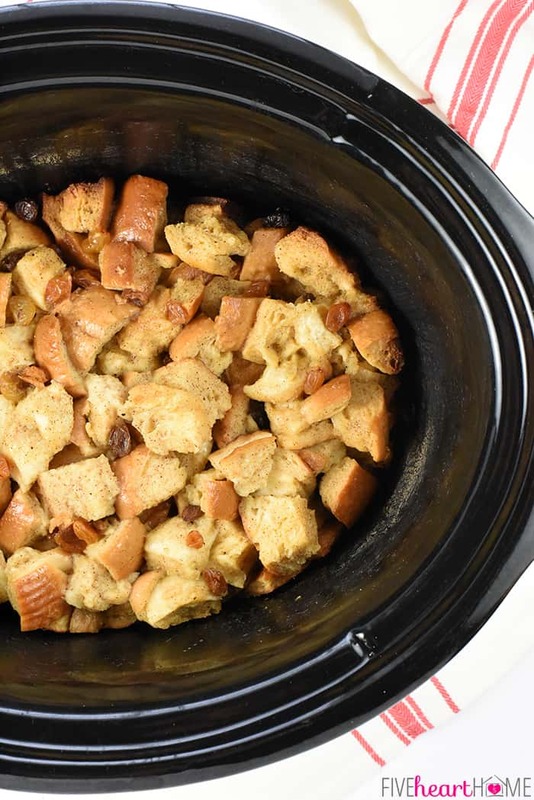 So if you have a newer-model slow cooker that runs hot, your bread pudding is probably going to be done in the minimum recommended cooking time, if not even sooner. On the other hand, if you have an older-model, cooler-running slow cooker, your bread pudding will probably take longer to cook through. Just keep an eye on it the first time you make it and all will be well. 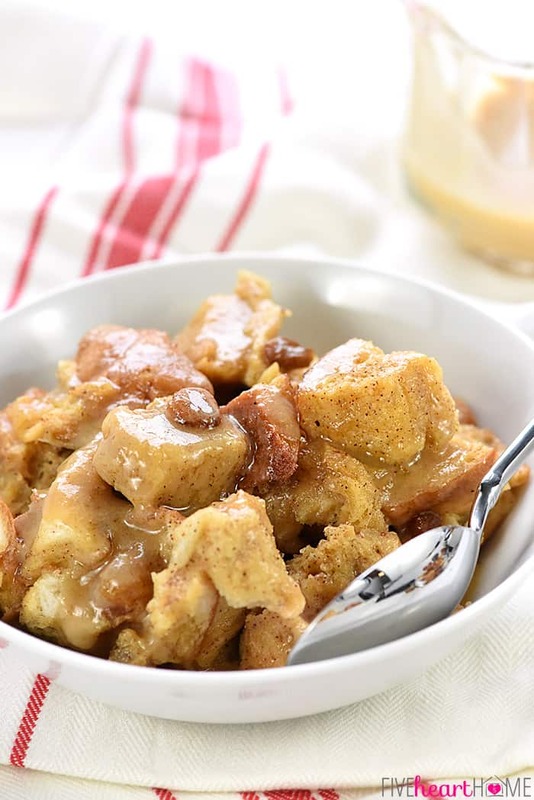 Delicious and decadent Slow Cooker Eggnog Bread Pudding effortlessly cooks up in the crock pot, freeing up the oven for other recipes. Studded with golden raisins, sprinkled with nutmeg, and drizzled with a silky eggnog syrup, it's a perfect holiday breakfast, brunch, or dessert! Generously grease a large (6- to 7-quart) slow cooker with softened butter (or spray with nonstick cooking spray). 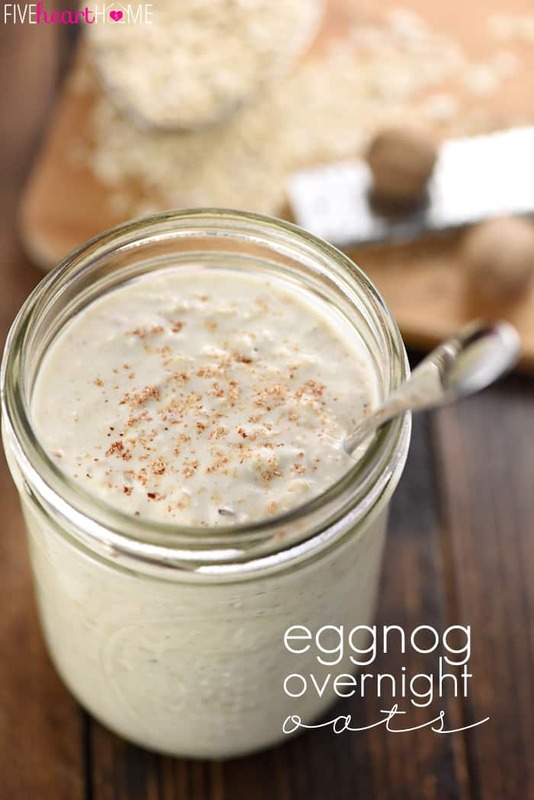 In a large bowl, whisk the eggs and blend in the eggnog and brown sugar until well combined. Whisk continuously while streaming in the melted butter, then mix in the vanilla, cinnamon, and nutmeg. Add the bread cubes to the bowl and use a large spoon to stir until all of the bread is soaked with the eggnog mixture. Gently mix in the raisins, if using. Transfer the mixture to the prepared slow cooker and smooth the top into an even layer. Cover and cook on LOW for 2 to 3 hours, until just set and a knife inserted in the center comes out clean. Just before the bread pudding is done, prepare the Eggnog Syrup. In a small saucepan set over medium-high heat, combine the eggnog and the maple syrup. Bring to a simmer, watching closely stirring occasionally, and adjusting the heat as necessary. Simmer for 5 to 7 minutes until the mixture is reduced and thickened. Remove from the heat and stir in the butter until melted. Allow the syrup to slightly cool and serve it warm over scoops of bread pudding. I use a loaf of regular HEB French bread when I make this recipe. Just about any type of bread should work, though...just make sure you have about 10 cups once cubed. If my bread is fresh, I cube it the night before I want to make this recipe, spread it out on a sheet pan, and let it sit ovenight to dry out and become stale. If you wish to speed up the process, place baking sheet in a 250°F oven for 30 minutes or until the bread cubes are dried out. You may have leftover Eggnog Syrup, which is great on pancakes, waffles, pound cake, ice cream, stirred into coffee, and so much more! 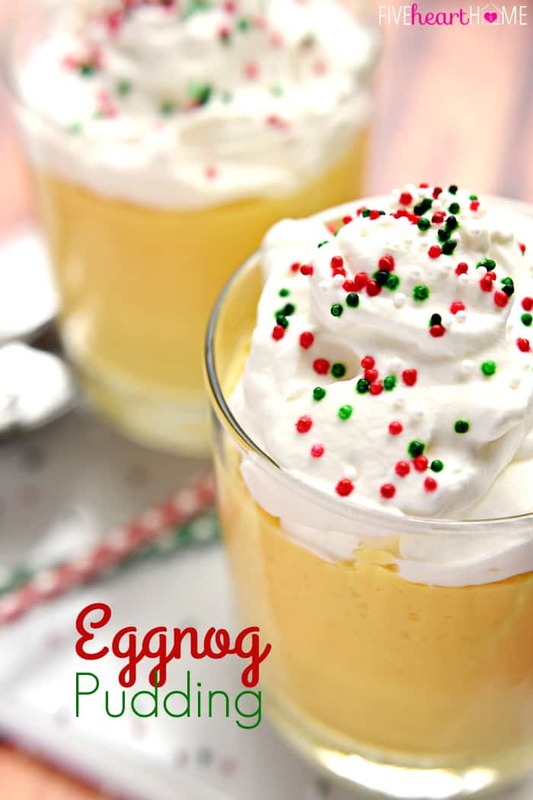 For a boozy dessert twist, mix a splash of rum into the eggnog custard (and/or eggnog syrup). 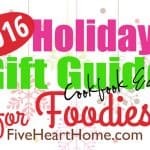 Don’t have a slow cooker, can i do eggnog recipe in the oven? For anyone not familiar with HEB, it’s a chain of supermarkets in Texas. So I made this today and it was amazing! But I put a few of my own touches on it and I wanted to share because it was so amazingly good! First off I didn’t have any nutmeg…and didn’t want to go back to the store. Nutmeg to me is a little on the spicy side so I put just the tiniest touch of coumin instead with the cinnamon and brown sugar it was perfect. Well, about as perfect as it could be without nutmeg! Thanks for the recipe girl, it is amazing!